Swept up in the wave of the mid-2000’s property boom, planning authorities signed-off a series of new high rise developments in London- bigger and bolder than any in the city’s history. It is only now that the cumulative effects of these decisions are emerging on the London skyline. Faced with the bleak picture of our current economic climate, these buildings could be seen as the height of speculative folly- rampant capitalism gone awry in the kind of short-term money grabbing that led to the current economic crisis. Or maybe, to take a more optimistic view, are these instead symbols of confidence in London’s ability to ride-out the storm? 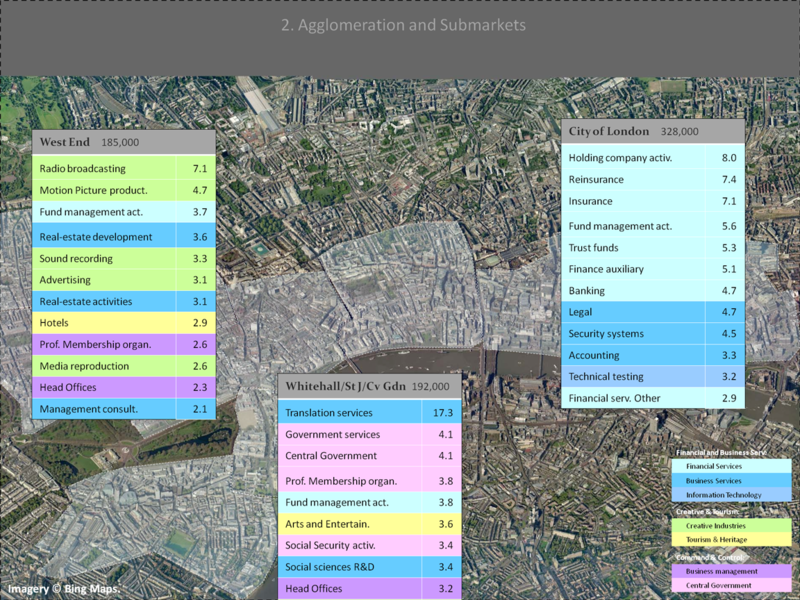 London is overall a low density city compared to say New York or Tokyo, or even Paris. The UK’s first experiments with high-rises began post-WWII, with cheap Corbusier tower imitations built to solve massive housing shortages. These towers were often aesthetically dull, difficult to live in (even dangerous), and conflicted with traditional street networks. Even those few high rise projects of good quality (like the Barbican) divided opinion with their aggressive style. Hence the traditional dislike of high-rise building in Britain. 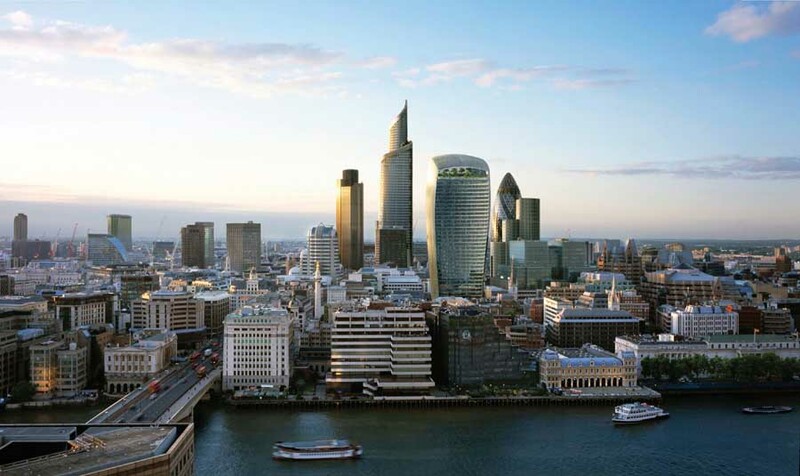 This attitude began to change with the commercial success of Canary Wharf in the late 1990’s, and the popularity of 30 St Mary Axe by Foster & Partners, nicknamed the Gherkin. High-rise developers now actively promote skyscraper nicknames to make their multi-million investments seem more friendly and part of the city’s furniture. 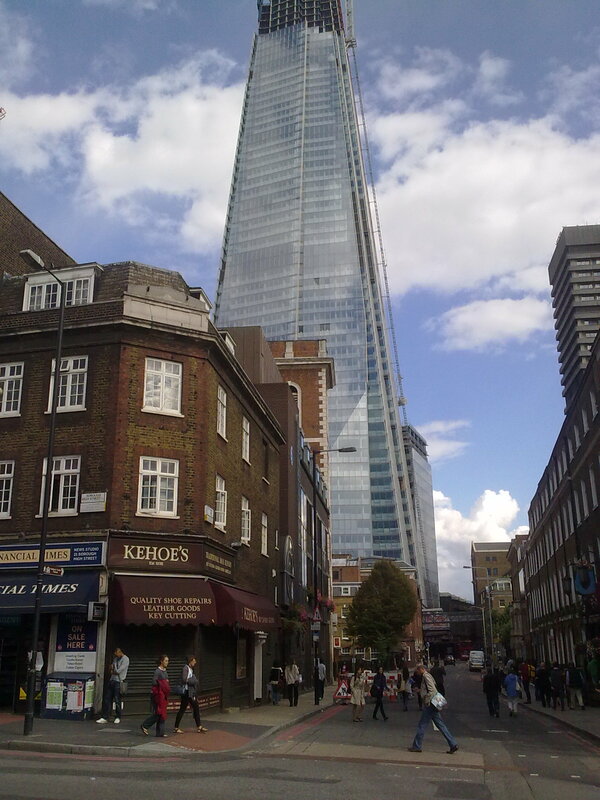 By far the tallest of the current crop of London skyscrapers is London Bridge Tower, or the ‘Shard’, which is now nearing completion. At a height of over 300 metres it’s not tall by international standards, but for London it’s a giant, 120 metres taller than the Gherkin. It sits outside of the main high-rise City cluster on the Southbank and, like Canary Wharf tower before it, could form the centre-piece of a new cluster. It’s certainly awe-inspiring, creating a Manhattan-like vertiginous feeling when you get up close. 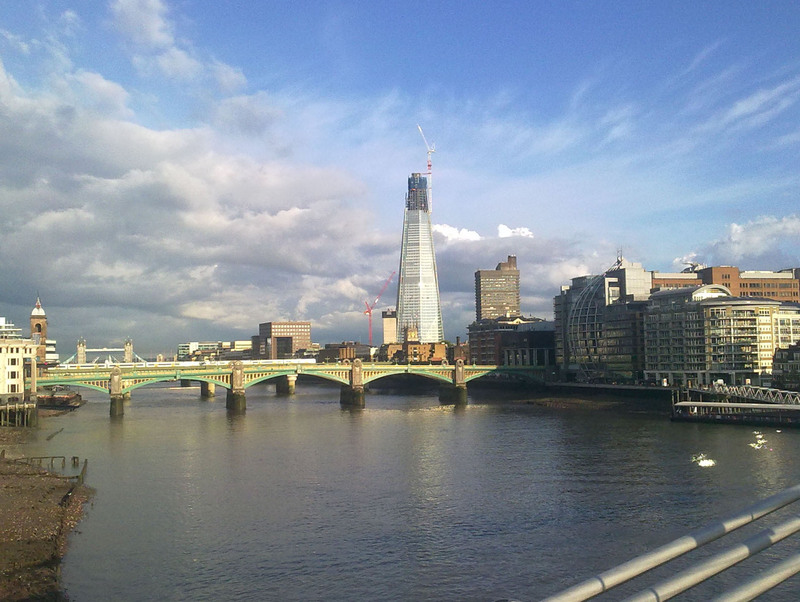 The tapered spire-like form limits the visual impact of the massive structure, and it sits not unattractively amongst the jumble of buildings south of the river. Yet despite the Shard being an engineering marvel, you have to question whether this is an appropriate direction for the future of London. In scale terms it dwarfs anything on the London skyline, sitting incongruously with historic sights such as Tower Bridge and St Paul’s Cathedral. Despite architect Renzo Piano’s claims that he was inspired by London’s historic spires and ship masts, the structure appears sleekly anonymous and corporate, transferable to any world city, Dubai-on-Thames. There’s more than a hint of Bladerunner about the design, like we’ve decided sci-fi dystopia is the way-to-go for London. Perhaps this is a honest expression the social inequalities we’ve created, argues Jonathan Jones. 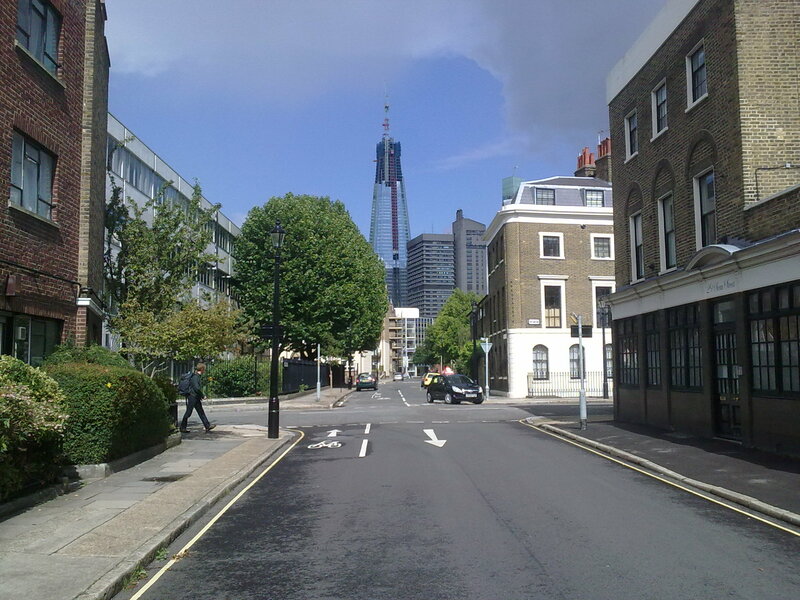 Time will tell how the public judge the Shard (or whatever alternative moniker catches on- the Spike? the Prick?). Soberingly it’s probably the best of the current breed of new skyscrapers in London. 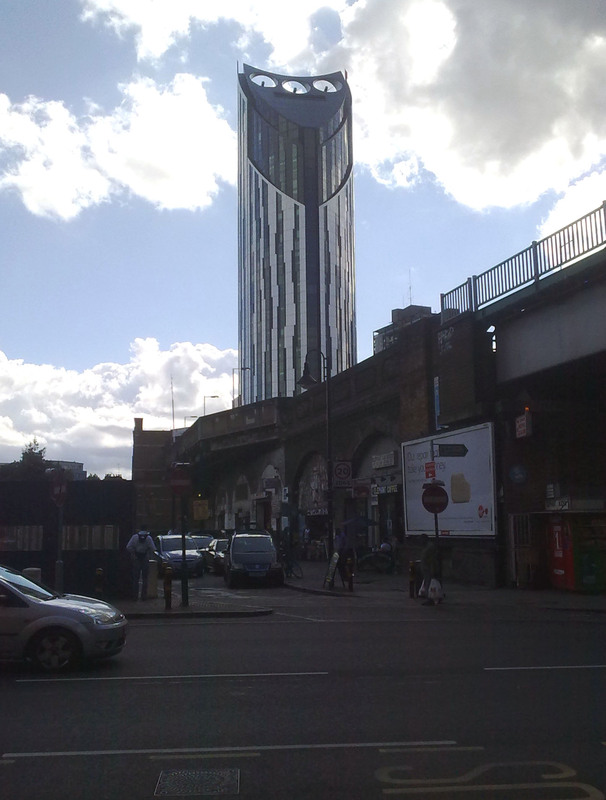 Continuing the theme of sci-fi kitsch, the worst new building in the UK, as voted in the 2010 carbuncle cup, is the Strata Tower at Elephant and Castle. 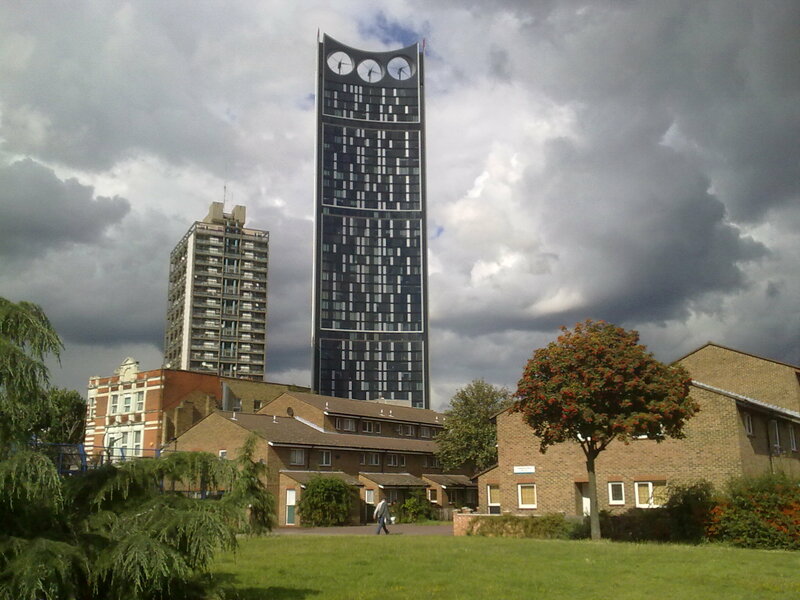 The Strata has an aggressive plastic-looking form, topped with three wind turbines. These turbines will reportedly supply 8% of the building’s electricity needs- a poor return for such a visually intrusive feature. High density development can bring sustainability benefits, but the embedded energy from the construction of thousands of tonnes of steel, concrete and glass nullifies the green credentials of any skyscraper, and the Strata tower’s turbines are surely the worst kind of greenwashing. Developers have dubbed Strata Tower the ‘Razor’, though I find the alternative moniker of ‘Sauron’s Tower’ better captures the building’s design and symbolism. Tolkien fans will note however that Sauron had a good deal more style than the Strata, and preferred geothermal power. The real tragedy of Strata it that it’s supposed to be the catalyst for the regeneration of Elephant and Castle, a deprived district, notoriously badly designed with oppressive road intersections and 1960’s mass housing. Plans for major regeneration have been in place for many years, but there is currently little evidence on the ground. At present the debate is focussing on tranforming the traffic interchange, with TfL blocking more radical plans due to reduced vehicle flow impacts. Not to be outdone by these Inner London imitators, the money-machine of the City has it’s own ambitious plans to win London’s race to the top/bottom. This includes a rather elegant fountain-pen shaped tower dubbed the Pinnacle, similar in height to the Shard, and also what I believe will go down as the biggest mistake in the current generation of London skyscrapers- 20 Fenchurch Street Tower. This ‘unique’ design gets bigger as it rises, thus providing larger floor-plates to maximise rents, and creating what will likely be a highly overbearing form at street level. Worst of all is the view from the Thames, where the building presents a bulging outline and inward looking face, in a remarkable resemblance to a sore thumb. In profile it looks like a hoodie. 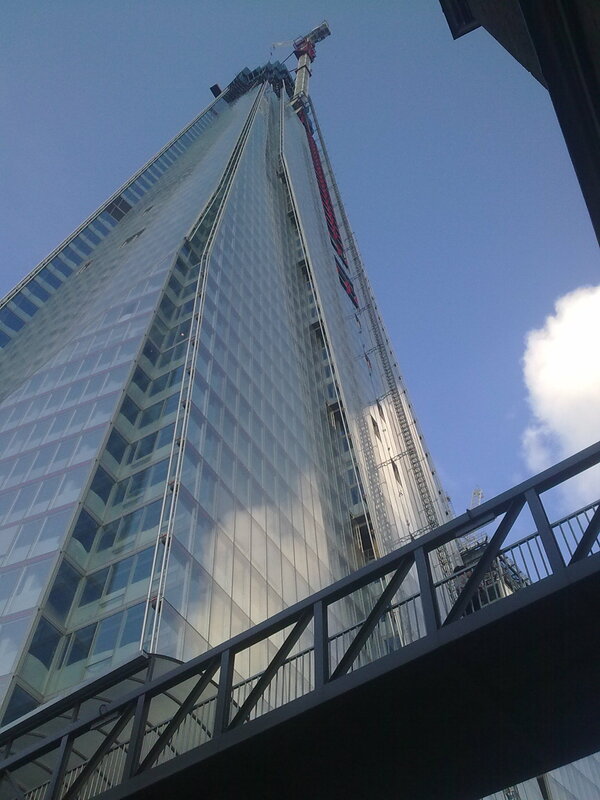 The Sore Thumb is now back under construction and is coming Londoners’ way in 2014. Can we learn anything then from London’s new skyscraper bestiary? Our age of iconic architectural bling seems to have entered a new phase of attention-grabbing arrogance, with playful techno-futuristic aesthetics used as a marketing tool for investors and to soften the edges of raw soulless capitalism. For every interesting design there are several ungainly mistakes, and planners don’t seem to know the difference. Or alternatively authorities have decided that development trumps aesthetic or environmental concerns (worryingly this mode of thinking is the basis for proposed reforms to the planning system- more in a later post). 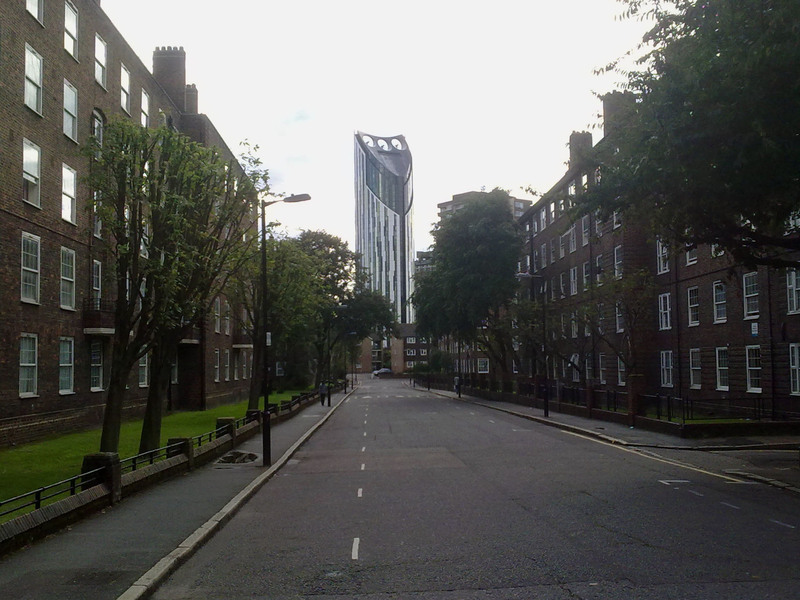 The eccentric architectural laboratory of London continues with the modernist relics of the 2oth century now paired with our own 21st century futuristic fad, except this time the buildings are three times taller. If we imposed a blanket-ban on all structures higher than 100 metres then coming generations would probably thank us.